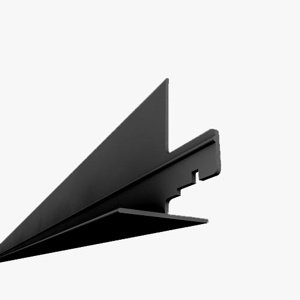 These are PVC black Cross Ts are part of your Rust Proof, Vinyl Ceiling Grid. Designed for interior drop ceiling and meet code for non-seismic required areas. Minimum plenum spacing is 4"
Indoor Use only, Can handle temperatures up to 90 degrees. Not Seismic rated. Cross Tees connect to the mains and should be spaced every 2ft (for 2x2 tile spaces) or 4ft (for 2x4 tile spaces). Works with our 8' black mains and 8' black wall brackets.